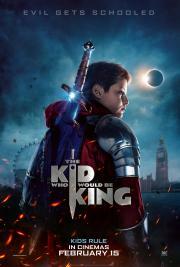 The Kid Who Would Be King is a decent film that has a fair amount of charm, despite its straightforward plot and mediocre script. Nothing in the film is new or impressive, with the visuals often emulating LotR, but the wholesome themes, and the earnestness in which they were delivered, surprisingly worked - even if they were a bit on the nose. The film's interpretation of chivalry gives credence to Cervantes' criticism in Don Quixote, but that’s a minor quibble and a different discussion. As this went on it seemed to lose the ingenuity that Cornish demonstrated so well in Attack the Block. Putting kids in outrageous situations seems to be his thing, but AtB did so with more excitement and humour along with being more unpredictable. This started as a clever kids movie and degenerated into a very basic, lackluster fantasy flick with kids in it. I'm sure less critical eyes (kids) could get something out of this but I can't say that I really enjoyed it after a certain point. A decent, very English family film. Nothing shines here but it's not boring either. Merlin is fun, the way he was powered down was decent. This will be more about the genre in general than on the particular example, but still: Don't you find that themes such stories spend time to develop, like honor, courage and so forth, are most commonly mutilated into a heinous travesty by the very premise that there is surely destiny? After a somewhat self-aware opening act, the movie dives headfirst into a standard heroic fantasy with shoddy effects and corny dialogue; it almost seems like a tv movie that somehow found a way to theaters. At least Merlin is fun to watch, if Imrie more so than Stewart. This was good. It’s January release material for sure, but it actually has a meaningful story and a decent emotional core. I did think it was too long, but it’s still a really fun, safe family trip. Angus Imrie steals the camera in his scenes as Merlin, and the rest of the young cast is also good. Fans of the story of the sword and the stone will most likely be pleased. If you’re looking for something to see with your kids or the family, this is the best place to go right now. The amount kof exposition in this movie was unbearable. There were scenes where they repeated the same speech without a pause. The directors seem to think the audience is either stupid or have the attention span of a curious puppy. Beyond the terrible directing the cast overall was just ineffective. I felt like I wanted bad things to happen to them as comeuppance for such bad performances. There was never a sense of real danger either which totally defeats the purpose of this kind of movie.